The Little Giant 14016-001 Alta One Type 1 Model 22-feet Ladder is a multi-purpose ladder ideal for use with medium-sized tasks. It has unmatched durability and strength as it is made from aerospace-grade 6005-T5 aluminum. Its ultra-strength build makes it capable of withstanding pressure of up to 250 pounds on either side of the ladder. Even with its great capacity, it remains a lightweight ladder type. The Alta One is known for its strength and versatility. Its strength that comes from the aerospace-grade aluminum construction, which guarantees the stability of the ladder. It comes with wide-flared legs that also contribute to the stability of using the ladder while working on a task. Its rubberized feet prevents slipping and thereby avoids accidents while on the ladder. The Alta One has the patented convertible design of the Little Giant, where in you can configure the ladder in 5 different ways suitable to your needs. It can serve as an A-frame ladder, extension ladder, staircase ladder, 90 degree ladder, and a trestle-and-plank scaffolding. These variable designs enable you to tackle different tasks in a building such as light bulb repairs, painting jobs, roof climbing, and other medium-sized applications. With all of these ladder types in just one model, you can just buy the Alta One instead of five separate ladders that serve different purposes. Not only does this save you money, it also saves you space and hassle. Another advantage of the Alta One is its safe use. Unlike standard ladders that have minimal safety features increasing the chances of injuries and accidents, the Alta One has a stable and secure design that guarantees your safety while using it. One of the main causes of ladder-related accidents is when users overextend beyond the capacity of the ladder. With the Alta One, you do not need to risk your safety since you can adjust its length to reach high surfaces. You have 24 configuration options to ensure that you get the safest and most suitable ladder design for each of your tasks. Multiple adjustment options for you to find the best configuration particular to the task you are undertaking. The strength and durability of the 6005-T5 aluminum used in aerospace construction ensure the stability of the ladder when used. With the use of the patented hinge of the Alta One, you can use the ladder as the traditional A-frame ladder for basic applications. The staircase ladder design is ideal for use on uneven ground such as the stairway, docks, as well as curbs. You can achieve the desired configuration is one-foot increments. When working on bigger projects, you can convert the Alta One to an extension ladder to reach ceilings, rooftops, and even trees. If you will be working close to walls, the Alta One can be converted into a 90-degree ladder so that you can work efficiently and safely while inclined to a vertical surface. And if your task requires a scaffolding, you can pull the Alta One apart to form two scaffold trestles. With the Little Giant’s confidence in their line of ladders, you can benefit from their Lifetime Warranty. The OSHA and ANSI A14.2 standards for product safety as well as quality are met by the Alta One. This serves as a guarantee of the quality of the ladder. Who Needs the Little Giant 14016-001 Alta One Type 1 Model 22-feet Ladder? Whether you are a homeowner who is in-charge of fixing and repairing structures in the house, a DIY-er who is an enthusiast for home improvement, a building painter, or anyone who needs to use a ladder every once in a while, invest in the Alta One is what you should do. Instead of buying a particular type of ladder, your money will be better off paid for the Alta One since this is an all ladder types in one model. So whether any other necessity and task may come up that requires the use of a ladder, you can easily tackle them by adjusting the configurations of the Alta One. 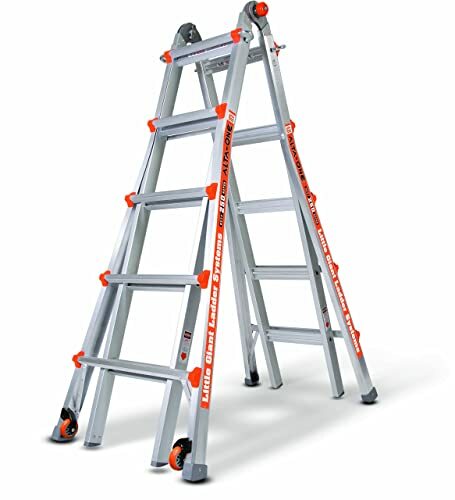 Customer Reviews: What Do Customers Have to Say About the Little Giant 14016-001 Alta One Type 1 Model 22-feet Ladder? As you browse online, you will find a huge selection of reviews about ladders including the Alta One. Amazon is one of the places where you can find different accounts on the actual experience of users with this ladder. Currently (at the time of publishing) , the Alta One has garnered 447 Amazon reviews, with a majority granting this ladder with 4 or 5 stars. Many highlighted about the versatility, steadiness, and durability. A few percentage of the reviews are not good reviews about the ladder. The downside, according to these customers, were the narrow steps of the ladder and its weight. Still, the Alta One is ladder that you can benefit from in the long run as long as you use it with light to medium-sized jobs only. A good amount of positive reviews about Alta One can be found online. However, distinguishing the quality of the ladder and its suitability to your needs and preferences still lies in your hands. Alta One is one of the ladder types you must consider with its sturdiness, adaptability, and reliability. Despite some its downsides, it is highly endorsed for multiple uses.